Which is a pity because the city is certainly worth the trip. Although the legacy of Soviet town planning is still fairly ubiquitous (and not uniformly bad), Minsk has plenty to offer the visitor. The area round the city was settled by Slavs in the 9th century AD, with Minsk itself first being mentioned in chronicles in 1067. Situated on the banks of the Svisloch River, in medieval times Minsk lay on the busy trade routes between the Baltic and the Black Sea. Commerce brought wealth and local goods like amber, furs and beeswax were sold to merchants whose boats passed through the city. Unfortunately, over the centuries Minsk has also had the misfortune to find itself a battleground for surrounding powers or in the path of armies as they marched through. In the early 18th century the Russians and Swedes fought battles of the Great Northern War here. A hundred years later Napoleon passed through on his failed march to Moscow and in World War II Nazi troops took the same route as part of the equally ill-fated Operation Barbarossa. Before the Great Patriotic War – as World War II is known in Belarus – Minsk had a large Jewish population. During the war, the invading German forces deported many of them to death camps, such as Auschwitz. Those who could, fled. Some 100,000 Jews were imprisoned in the Minsk Ghetto. After the Red Army pushed the Germans back in 1944, the fighting left Minsk as little more than a pile of rubble and many of its people dead. The city was rebuilt and styled as the gateway to the Soviet Union intended to showcase the achievements of Communism. I arrived expecting to find a sombre, grey city, so I was surprised to find pleasant boulevards, appealing architecture and numerous parks and open spaces. Even in the depths of winter it had its charms. Many of the buildings in the city centre are in the Stalinist Empire style, also known as Socialist Classicism. Together, they make up an impressive architectural ensemble along Minsk’s main thoroughfare, the 2.9 km long Independence Avenue. Soulless apartment blocks from the 1960s and 1970s are less attractive, but not much different from those one can see elsewhere in Europe. 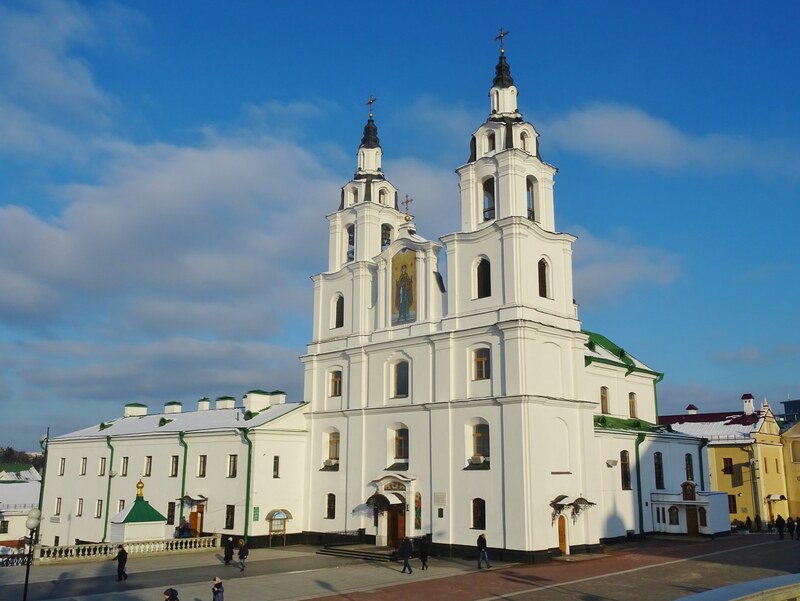 Following the collapse of the Soviet Union, churches – like the Holy Spirit Cathedral in the main photo – have also been renovated, their golden cupolas sparkling in the winter sun. The effects of the Great Patriotic War still resonate throughout Minsk. Unsurprisingly, there are few buildings left from pre-war times. A small part of the old city has been rebuilt, though, giving an impression of what much of Minsk looked like before it was raised to the ground. The fate of the city’s Jews is also remembered in a series of thought-provoking memorials. In summer, the city must be very green with its many parks. I visited in winter when temperatures were low, the days short and the ground covered with snow. Yet the welcome was warm and the people friendly!